This may come as a surprise to my loyal readers; but, I’m a Democrat. So, last night was a bad night. I was following the NY Times, and, suddenly and unexpectedly, the needle swung from 73% Clinton to 51% Trump. And it got worse. At 9pm I decided that I should not keep following the election. At 10pm, I peeked at the news and it wasn’t good. I decided to go to bed. But my husband woke up at 3:30, and he turned on his iPhone. “Trump is President.” he gasped. I felt like I should vomit. And I was awake for the day. 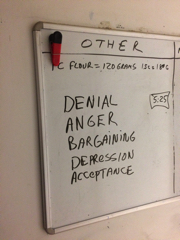 My husband went downstairs and posted the five stages of grief on our white-board. I wanted to feel numb. I had gone to the library the day before. I was nervous, even though the polls said that Hillary was clearly going to win. The question was only at what margin, and whether the Democrats would also regain the Senate. But I’m a worrier. I wasn’t going to a party. I wasn’t going to party. I planned to just read a book, go to bed, and check the news Wednesday morning. The previous day, I’d told my daughter that we would celebrate Hillary’s election with chocolate croissants. I bought some frozen at Trader Joes, and set them out overnight to rise. When Wednesday morning dawned; they were our only solace; albeit, a bitter, ironic solace. Only the grandchildren calmed me. Children won’t leave you alone with your thoughts. Neither my daughter or I wanted to be alone with our thoughts. On Wednesday morning, I didn’t believe it. I think I’m still stuck in denial. I certainly don’t want to be part of the blame game. I don’t want blame Hillary. I always believed that she was an earnest, and gritty Methodist girl who only wanted power in order to do what was right. My heart breaks for her. I don’t want to be angry at the Democrat party for supporting the wrong candidate. For daring to nominate a female. For refusing to admit that no one will vote for a woman. I don’t want to be angry at my niece, who voted for Jill Stein. I don’t even want to be angry at the Trump voters. I think everyone here was trying to do what seemed right. Maybe right now, I’m just bargaining with myself. On my Facebook status I wrote. I won’t think, I bargained. On Wednesday morning, I made breakfast, I grocery shopped, I babysat kids, I did a short hike with my daughter and grandsons. It was a good day. I won’t think, I bargained. But…every few minutes, I remembered, and felt like I had been kicked in the stomach. She looked at me kindly. My daughter confided that she is on a Facebook page with other private therapists, and their worry is that ObamaCare will be repealed, and their clients will no longer be able to pay for the therapy they need. My worry is that family members with depression will no longer be able to afford the anti-depressants that keep them sane and working. “All right, let’s not talk about it.” I said. I meant to stay away from the Internet, but I couldn’t not look. Yeah. I was depressed. I wondered if I could last 4 years without reading the Internet. I got more depressed. At this point in this article I’m supposed to talk about acceptance. I mean, yes, of course, I pray that President Trump will be a success. I hope he’ll go down as one of the greatest Presidents we’ve ever had. I hope I’ll laugh at this hysterical, paranoid article. Yeah, miracles happen, right? But am I going to accept the next 4 years, come hell or high-water? No. I hope not. I pray not. No. Tonight, I just hope this is all a horrible nightmare and I will wake up tomorrow in the right country; in the right universe; and in a world where I don’t have the five stages of grief written on the white-board in my hall.